In this tutorial we are going to look at some Photoshop lighting effect that will allow us to take an ordinary photograph and make it into a great sunset scene photo. Load the photograph that you want to edit. Here we have a fairly ordinary shot taken in the bright midday sun. The first thing we have to do is give the photo a filter so it will look better with the lighting effects we are about to apply. Click “Image”, navigate to “Adjustments” and select “Photo filter”. Make sure the “Warming filter (85)” is selected and set the “Density” to around “35”. This factor will vary depending on the photo you are adjusting. Click “OK”. We are going to use the lens flare effect here to simulate the sun setting on the horizon. 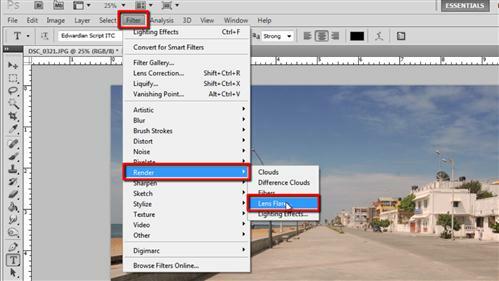 Click “Filter” in the main menu, navigate to “Render” and click “Lens Flare”. In the window that appears use the thumbnail of the photo to place the flare. It should be close to the horizon. The “Brightness” setting you select will depend on your photo, here we are going for a setting of around 80. Just adjust it until your photo looks right. Click “OK”. To complete the effect in the photo let’s add some additional lighting effects to make it appear later in the day. 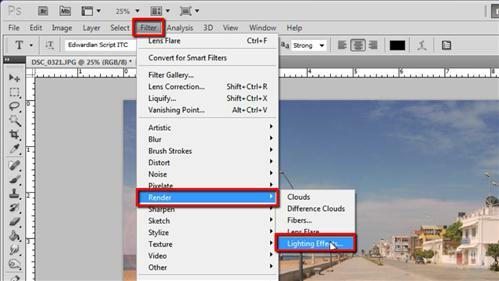 Click “Filter” again and navigate to “Render”, then click on “Lighting Effects”. A window will open and you will be able to adjust the settings of the rendered lighting. Use the thumbnail and the points within it to adjust the lighting settings, once again this will be a process of trial and error, keep at it until you find a setting you like. 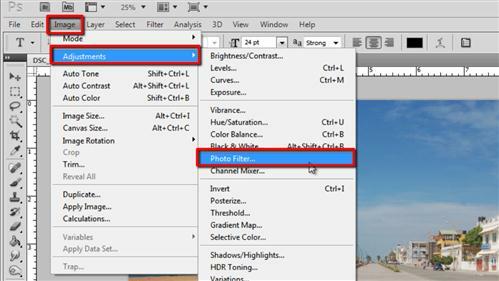 When done, click “OK” and that is how to create some great Photoshop lighting effect.